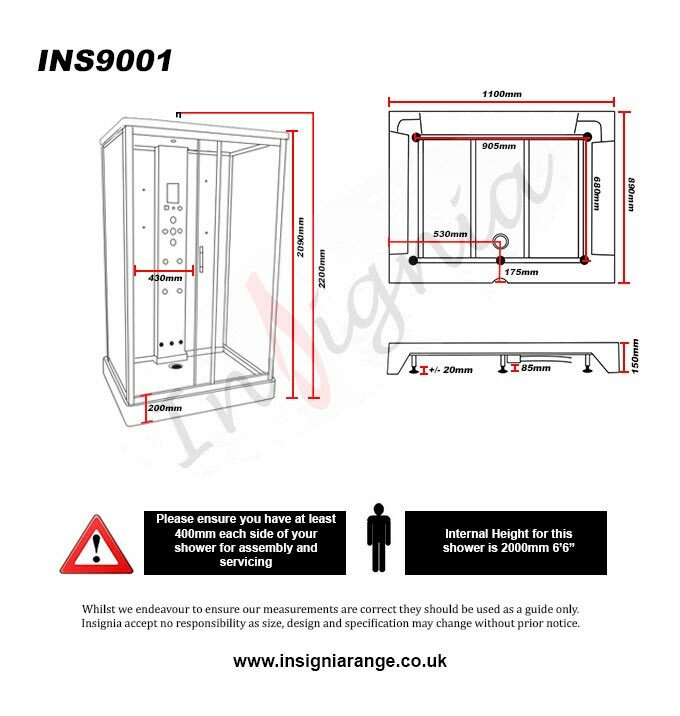 The Insignia INS9001 is the latest model to be released by Insignia and for those looking for a little more space this really does fit the bill. 1100 x 890mm - Elegant, stylish and practical, it is a real winner! The INS9001 is packed with features and very spacious, at 1100mm by 890mm, the interior of this shower is incredibly spacious, giving you that elbow room from all angles. Inside the cabin is an overhead monsoon rain shower, which is surrounded by Chromotherapy lighting to brighten the interior. This is complimented by the mirrored back and side panels, making the internal lighting multiply by reflection. The microphone style hand shower is located on a back panel, on a convenient and easy to use riser rail, so you can choose the best height for you. You have a cluster of 6 hydro-massage jets in the column, situated perfectly to enjoy a relaxing back massage whilst sitting on the wood effect seat which is included as part of the package. Insignia �M� Bluetooth active touch screen Control Panel. You need 2.5 -3.00 bar pressure supply. Debit required approx. 12 litres per minute. A 13 amp fused spur is required to provide electricity to the shower. The shower is supplied with a 3 pin plug with an RCD fitted for your safety.